Don't leave your furry family behind! 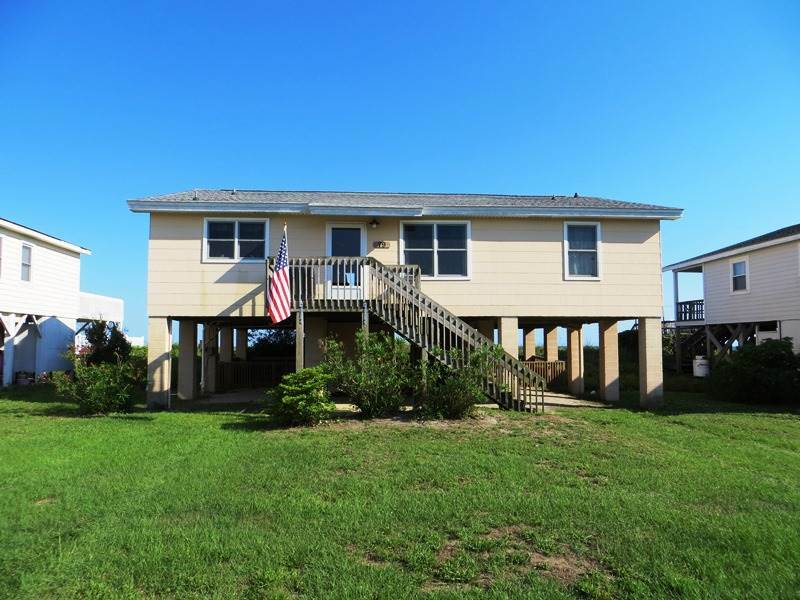 Bring Fido or Frisky along with your family to Dog Daze Cottage at Ocean Isle Beach. . Rustic, three bedroom, two bath OCEANFRONT cottage with bunkroom, sleeps 9. Covered porch facing the ocean with fenced in dog run. Newly renovated kitchen and master bath. Charming! Amenities: Beds (Queen, Double, Single, 2 Bunk Beds), Washer/Dryer, WiFi, TV with DVD and VCR player, updated appliances in kitchen, outdoor furniture and hammock, covered parking, covered porch facing ocean, hot & cold outdoor shower. Note: one of the guest bathrooms only has a tub, no shower. The house was more than I could have asked for. The fenced in dog run was the best for letting my two small dogs out. I loved being able to walk down to the beach without leaving the property. The kitchen was amazing but could use some updated cookware as everything stuck to each and every pan used. It was a little inconvenient to only have a bath tub in the one bathroom but we managed. Washer and dryer is in the house so that is super convenient. Updated master bathroom was gorgeous. I would recommend adding a flat screen TV to the living room instead of the old tube TV just in case someone wants to bring a game system or a streaming device. Definitely cannot wait to stay in this house again next year. Our family stayed at this property over Labor Day weekend in 2015. The photos are very accurate, and the place is very clean and well maintained. The beach is just a very short walkway. This is a beautiful place for a vacation.